The tire impact of the last years together with the global warming have provokes the interest to all-season tire. But despite the massive attack on the market of the all-season models, specialized winter tires do not intend to lost ground, since it is they that provide the best safety in winter conditions of exploitation. 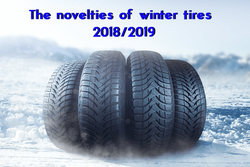 Our traditional overview winter tires novelties focuses on the most forward-looking car owners, who in the background of calendar summer is beginning to seriously thinking about forthcoming replacement of tires and thoughtful examining the variants offered on the market. In the survey «The novelties of winter tires 2018/2019» we can see 51 models, however, even no matter the impressive number, it is difficult to say about overall trends in winter tires elaboration as an example about shift towards UHP tilting pad in summer tires. Obviously it may be argued only that European market is a very tender part, which not only local manufacturers want. Even Asian and American tire manufacturers it haunted by it. Early in the 2018 the Continental company submitted the new VikingContact 7 winter friction tires designed for complicated road and weather conditions of the Nordic countries. Due to optimized symmetrical tread pattern and rubber compound with the inclusion of colza oil the Continental winter passenger tire of seventh generation surpass those of the ContiVikingContact 6 predecessor in road holding on wet surfaces, snow and ice. Under one of the subsidiary brands the German concern has produced friction the Barum Polaris 5 winter tires, which are recommended for exploitation in condition of mild winter climate of the Central European countries. Due to good value for money this novelties of 2018 will replace highly popular Barum Polaris 3 tires available on the market since 2011. Known as non-studdable tires on the Japanese inner market Bridgestone Blizzak VRX2 will be available in Russia under slightly modified name — Bridgestone Blizzak Ice. The «basic» model is positioned as the most traction on the ice from all existing tires of collection, therefore if the manufacturer has not modified the structure of rubber compound, Blizzak Ice will hold on to icy surface equally with ease and facility. In conjunction with above-mentioned on the market of North America the Bridgestone Company submitted the Bridgestone Blizzak W965 — Bridgestone Blizzak LT light-truck winter tires of Scandinavian type that would last one more season. Speaking about friction tires, it should be noted that the Japanese concern decided to use former interest of car enthusiasts in the Ice Cruiser 7000 model the last year with production Firestone Ice Cruiser 7 treads, which got the «legend» design. Taking into account already started sale of the new Bridgestone Ice Cruiser 7000S tires with the same tread pattern, it could be assumed that scale of popular love originally was undervalued, and probably we would hear some later about something like this produced under the Dayton brand. Jumping ahead, we will say that one of the new Lassa model is also tribute to «copy-paste» technology craze of manufacturers. The Michelin Company ambitiously updated its winter offer, which used all budget brands for duplication of two winters tread patterns, differing by only presence of studs. And not new, but presented a year earlier for cars of the SUV class. It did as much as 12 «new» models. So as for low-cost studdable variants for slipperiest ice and compacted snow in the arsenal of Michelin it have emerged Orium Ice, Taurus Ice, Tigar Ice and Strial Ice models, they are Kormoran Stud 2 and Riken Stud 2. Their non-studdable twins are: Orium Winter, Taurus Winter, Tigar Winter, Strial Winter, Kormoran Snow and Riken Snow. Under their main brand French tire manufacturers on the heels of Michelin Pilot Alpin 5 passenger novelty of 2017 produced its modification for city SUV — Michelin Pilot Alpin 5 SUV. In addition, it has begun active sale of winter passenger tires of European style of Michelin Alpin 6 type. The EverGrip technology has found its opportunity that assures the reliability of rubber grip property until the last kilometre of the mileage. The Michelin heavy «artillery» is X–Ice North 4 tires for harsh wither weather, the size of which implies placing both on passenger cars and SUV. According to concept of manufacturer, 250 studs of this winter novelty for 2018/2019 season will not give tires-competitors a chance. The base for Goodyear UltraGrip 600 is the model of the Dunlop Ice Touch subsidiary brands, along with there have been used the modern technological innovation Goodyear increasing the safety of movement even during unpredictable weather of the winter period. According to manufacturer the task of this winter tire novelty of season 2018/2019 is to replace in the product line the Goodyear UltraGrip 500 «long-liver». We are all done waiting «the second change» of Hankook Winter i*Pike RS W419 studded tires. The second generation of winter line of the South Korean brand, Hankook Winter i*Pike RS2 W429 tires, is diverse in terms of improved traction on the snow surface, owing to absolutely new tread pattern, increased number of studs’ lines and dislodged location. The Kumho WinterCraft WS71 and Kuhmo WinterCraft WP72 created for replacement the deeply retirement age Kumho I*Zen RV KC15 and Kumho I*Zen KW27 models accordingly are not even available yet. However its symmetric design reflecting present trends and also special uncongealable out in the cold rubber compound are promised to surpass their predecessors in popularity after its appearance. The northernmost tire manufacturer in the world is ready to win the client attention from colleague by means of new generation of the Hakkapeliitta winter fraction tire line, whose distinctive features are extremely rolling resistance and high comfort level. In this, both novelties of Nokian Hakkapeliita R3 and Nokian Hakkapeliita R3 SUV winter tires of 2018–2019 are capable of resisting «the most harsh winter weather conditions». For the regions with mild climate in the winter months Finnish tire manufacturers recommend for using the Nokian WR SUV 4 winter model of European type, which optimizes steering on the road covered with water, snow or slash. The Toyo Company in 2018 very effective modernized the Observe line. For European customers it produced two novelties — the studded Toyo Observe Ice Freezer (tested in Finnish and Japanese polygons substitute for Toyo Observe G3-ice), and also commercial Toyo Observe Van friction tire, which was launched at The Tire Cologne exhibition. One more «Observe» new of winter tires of 2018/2019 from Toyo is high performance non- as non-studdable Toyo Observe GSi-6 HP tires positioned as optimal chose for Canadian winter, that is known for snow and sun record with all related implications. Furthermore Toyo Snowprox S954 SUV has emerged in assortment of Japanese brand that have got the tread design of Toyo Snowprox S954 passenger model. It is tailored to the effective work on the wet surface while low temperature. In 2017 the Nexen Company brought to the European market Winguart Sport 2 passenger car tires intended to improve the safety of movement on the snow, wet and dry asphalt. This year the dimension range of the model was extended and covered the cars with high centre of gravity. The sign Nexen Winguard Sport 2 SUV is plastered on the winter tire sidewalks for SUV and KUV. Also in forthcoming winter coming it will be available the Nexen WinGuard Ice Plus model with tread pattern that do look like Nexen WinGuard Ice SUV, which in the absence of spikes is designed for confident «bushing» on frozen road surfaces and tired snow. Turkish Lassa has begun to produce the fourth generation tires of Snoways collection. Passenger car novelty Lassa Snoways 4 beyond the performance on snow and wet asphalt of the predecessor Lassa Snoways 3 in the winter season 2018/2019 will be available only in 16 dimensions for wheels of 14–17 inches, however as early as 2019 the assortment offer of novelty will be vastly expanded and it will comprise size including size for wheels with 20 inches diameter at rim seat. Lassa Iceways 2 is the winter model with tread pattern «passed away» Bridgestone Ice Cruiser 7000, mentioned by us, when we told about «copy&paste» in the beginning of our review. And that is the «new» winter elaboration, to which Bridgestone got its long hands. That is actually is not surprising — the Brisa Company produced Lassa tires is a participant of the joint enterprise with Bridgestone Japanese Corporation. The main difference of Lassa Iceways 2, for example, from Firestone Ice Cruiser 7 is the possibility of exploiting in non-studdable type. Represented in 2017 commercial winter tires Maxxis Vansmart Snow WL2 is just beginning win its positions on the market of Europe. It is fully adapted to requirements of vehicle fleet, composed of light truck cars, therefore it is remarkable by high carrying capacity, the duration of life expectancy and rolling resistance. Maxxis Premitra Ice Nord NS5 studdable model for cars of CUV and SUV also clears place under the sun. The key features, on which it was bet while its design are the good manoeuvrability on snow and ice and driving comfort. Apollo Vredestein to the last kept secret the design of the winter tires of European type Vredestein Wintrac Pro, designed to setting in muscle high-speed cars instead of Vredestein Wintrac Xrtreme S treads. Visitors of The Tire Cologne 2018 profile exhibition have become the first, who have appreciated UHP-novelty, which on cleared road you can use at speeds up to 300 km/h. The other two novelties of the brand were represented last October. The Vredestein Wintrac Ice tires with improved nearly on one fourth manoeuvrability on the ice will substitute for passenger studded model Vredestein Artrac that has 10-year history under its belt. Designed for minivans and light trucks friction tires Vredestein Comtrac 2 Winter will oblige to retire Vredestein Comtrac Winter, which have been produced for operating conditions specific to the central European winter. The presentation of the Cooper Discoverer True North «friction» tires of the premium class was launched in November 2017 in Las-Vegas during the Special Estate Equipment Association (SEMA) exhibition. In the same place Cooper Evolution Winter studdable tires were revealed for the first time, represented the medium price. Whether the new models will appear in Europe is interest question, the answer to which we will get only after a while. It should be noted only that Evolution Winter is positioned like replacement of the Weather-Master S/T2 tires, which has made its way to the customers in our latitudes. The diameters at rim seat, with which the Platin RP 60 Winter winter tires are accessible on sale, reach the line 80% of the target market of passenger cars and CUV. The strong resistance against hydroplaning, effective braking on ice and, of course, affordable price are the key features of this friction model of the private brand of the German distributor Interpneu. The part of the review about novelties of winter tires 2018/2019 devoted to Chinese brands, we will begin with the most famous from them — with Salum. The Chinese manufacturer added to his WinterPro product line the three new models. Passenger car tires Sailun WinterPro SW61, Sailun WinterPro SW81 and Sailum WinterPro SW82 are aimed at exploitation in mild winter weather conditions; in so doing each from them has its own characteristics. So, asymmetric SW61 is a choice of compact and golf-class car owners. The SW81 model with non-directional symmetric tread is intended to enhance the safety of drivers and passengers of middle class vehicle, meanwhile asymmetric SW82 is designed for gear of powerful high-speed vehicles. The Sailun Ice Blazer Alpine new non-studdable winter tires are designed for setting in family cars. Its pronounced directed design guarantees the good adhesion with snow, dry and wet asphalts. Produced by the Sailun Jinyu Group Co. Company the Blacklion Winter Tamer W616 tires are exact copy of the mentioned earlier model Sailum WinterPro SW82. The Chinese Evergreen makes the utmost effort to reliable become established in the European highly competitive market. Its another Evergreen Winterpro EW616 attempt is a novelty of winter tires 2018 in light truck segment, according to manufacturer, which is guaranteed to provide on-time cargo delivery in all surprise of the winter weather. The Evergreen Winterpro EW616 are exact copy of the Jinyu WinterPro YW55. In the final part of our review it would not hurt to remember about most vivid newest of the winter season 2017/2018: Bridgestone Blizzak LM001 Evo, Continental WinterContact TS 860S, Yokohama BluEarth W*drive V905 and Laufenn i Fit Van (LY31) tires.